Help Vince Catch His Breath. plenty of support from family and friends, and of course, financial assistance. For 33 years Vince has devoted his life to caregiving for his older brother, Nick, a Marine veteran diagnosed with schizophrenia. Vince has given of himself completely to be there for Nick and now he needs, and deserves, to be taken care of in a serious way. We really thought we were going to lose Vince in February, but as he told us, “It wasn’t my time and I’m not ready to go, I will fight this and breathe easy again!” Amazingly, through all of this, Vince has kept his sense of humor and looks to a life free of breathing treatments and being hooked up to oxygen. He will always care for Nick, but Vince also wants to enjoy life, plan a few vacations and finally see the ocean for the first time. Even with insurance, Vince will have many uninsured transplant-related expenses such as: co-pays and deductibles, doctor visits, at least two months of caregiver expenses and the costly anti-rejection medications that he will need to take for the rest of his life. This is a life-saving, but expensive procedure; it is also an overwhelming task to raise the required funds. We reach out to you with very high hopes that you will help us at this critical time. To help with the financial burden of Vince’s expenses, a fundraising campaign in his honor has been established with HelpHOPELive, a trusted nonprofit organization that has been providing community-based fundraising guidance to patients and their families for more than 30 years. 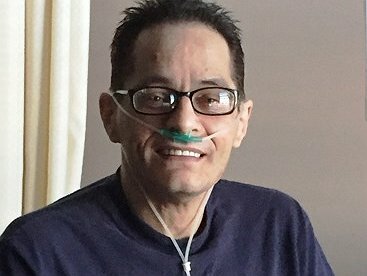 All donations are tax deductible, are held by HelpHOPELive in the North-Central Lung Transplant Fund, and are administered by HelpHOPELive for transplant-related expenses only. Please consider making a contribution today and click the DONATE NOW button. We need to all work together so that Vince can have a future — one where he can continue to make others laugh with his wonderful sense of humor. God Bless you! You got this!! Great attitude! We all love you! Oh my gosh! Remember our boxing days? Funny! We are practically twins and we both have a lot more living to do. You are such a strong and positive spirit - we can do this! Vince , you got this!!! Support you way! I have never had the honor of meeting you but have heard nothing but great things about you from Chris. I could not turn the chance down to be able to help in some small way. Our prayers are with you daily. Think positive and stay strong. Stay strong Vince-you're in our prayers ! Always, in my thoughts! Love ya!